Despite how it was made to sound last night, Pro Wrestling Sheet has confirmed Pentagon Jr and Fenix are not locked down to exclusive AEW contracts at this point. In case you missed it, The Young Bucks made an appearance at last night’s “Come Hell or High Water” event in Atlanta after the Lucha Bros defeated SCU. The AEW VPs stated Pentagon and Fenix are the second best tag team in the world, but they’d have to join All Elite Wrestling if they want to prove they’re number one. The Bucks then said they didn’t have formal AEW contracts to offer, but a handshake agreement would work. Before that could happen though, the group were attacked from behind by local wrestlers. SCU, The Young Bucks and Lucha Bros fought them off … then the two tag teams shook hands. Things got confusing hours later, however, after Chris Jericho tweeted saying the tag team had signed exclusive agreements with AEW — which would call their statuses with AAA, CMLL, Impact, MLW and Lucha Underground into question. 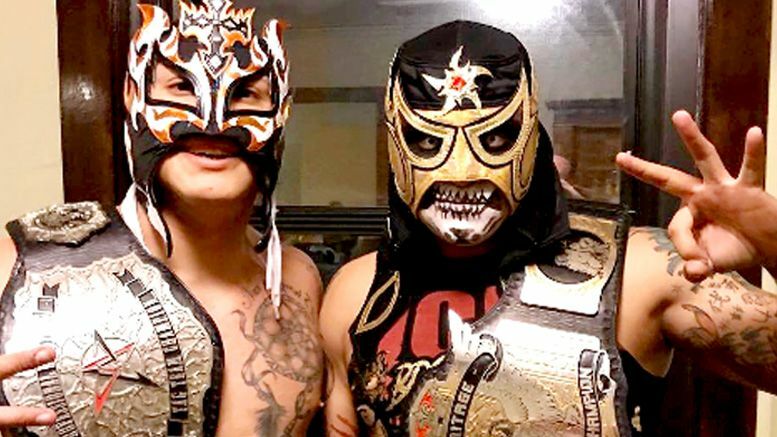 According to Lucha Central, which we’ve also confirmed with sources, Pentagon and Fenix will work dates for AEW but they’ve yet to sign an exclusive agreement. This means they’ll continue to fulfill promised dates in 2019 and work for a multitude of companies. Happy to see the Lucha Bros will be appearing in AEW? Sound off in the comments.